Filmmaker Greg Young follows Amy Gorman and Frances Kandl throughout the San Francisco Bay Area searching for female role models. 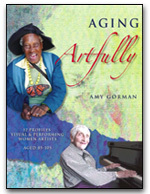 Six remarkable, artistic women emerge, aged 91 to 106, and share their insights on art and life after ninety. Bonus features include Grace's Song and a study guide for group discussion. Amy Gorman locates twelve remarkable San Francisco Bay Area women living with zest even in the ninth decade and beyond. Aging Artfully unravels perceptions and attitudes towards being old, and documents that old age can be a time of creative expression and gratification. Do you know yellowlegs is a storytelling museum?